When your father tells you he wants to be buried next to his parents, it can pose a problem if the family graveyard has disappeared. Behind him, Brent Boling drove a lawn mower over the grassy areas between plots while their friend Richard Williamson used a front-end loader to drop tree limbs into a dump truck. It looks beautiful now, but South Bend Cemetery, with graves dating from the 1800s, had gone back to nature by the time Yancey and a group of 30 or so volunteers started working on it. In the past three years, they have transformed it from jungle into garden. Mimosa trees grew up through family plots, pushing grave markers to the side. Headstones settled and toppled. Pine seedlings, vines and brush covered the area. Adding insult to injury, construction crews had illegally dumped multiple truckloads of shingles, old tires and other debris in mounds all over the 2.5-acre lot. Despite this neglect, South Bend was a notable cemetery. It was the same age as Atlanta’s venerable Oakland Cemetery and was the resting place for perhaps 24 soldiers who had served in the Civil War. A stone for an unknown Confederate soldier, dedicated by the United Daughters of the Confederacy, read, “Confederate soldier, unknown to fame, died for his country all the same. Rest soldier thy warfare.” A bronze marker from the state Historical Commission designated South Bend a historic cemetery. “People were afraid to come over here,” said Boling, 68, of Conyers, trimming grass near the grave of his grandfather, Herbert Clark. Upthegrove helped reclaim the Utoy Church Cemetery in southwest Atlanta, where Atlanta’s first physician, Joshua Gilbert, is buried. He regularly conducts tours at Oakland and said the crowds there indicate a growing interest in past generations. “In the old days if you had six people [in a tour], you had a crowd; now there’s 30 or 40,” Upthegrove said. This could be because baby boomers are getting old. 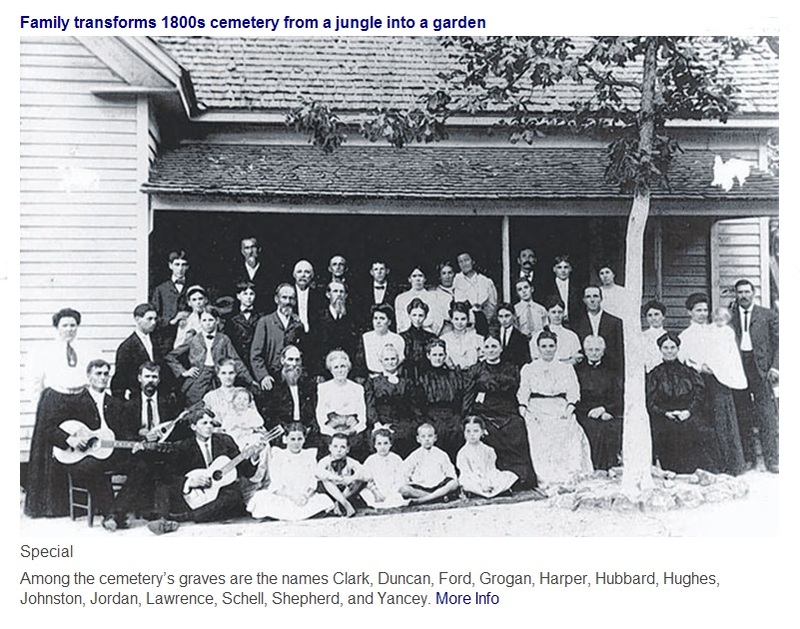 “People don’t get interested in genealogy until their 60s,” said Susan Tasse, 63, a retired schoolteacher, who buried an uncle at South Bend in 1981 and came back in 1989 to find the graveyard impassable. The Brookhaven resident discovered a photograph from around 1904 of her grandfather with a gathering of South Bend congregants, and it piqued her interest in the site. She began removing debris and clearing brush back in the 1990s. 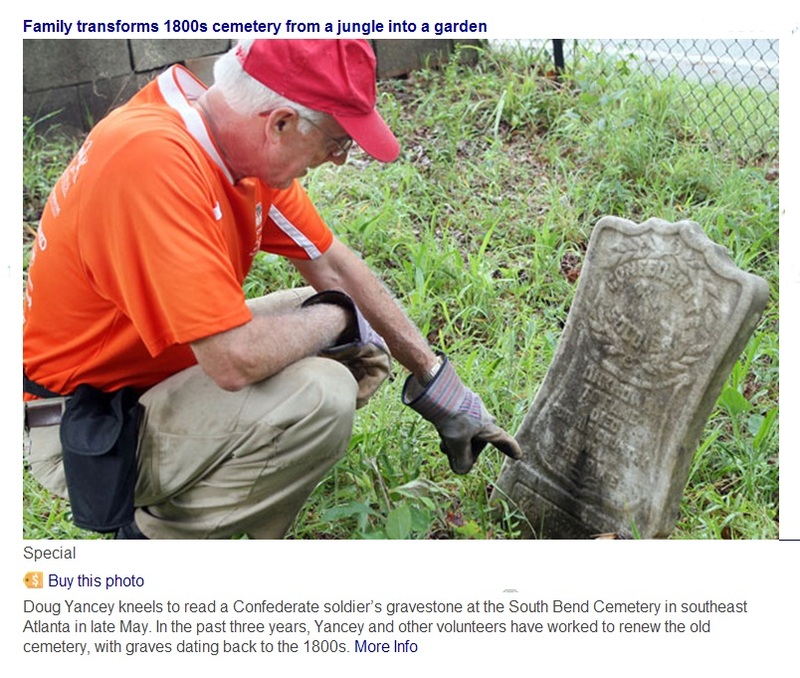 South Bend’s fortunes turned around in 2008 when the Atlanta Youth Academy bought the land surrounding the cemetery, fenced it in and tried to find the cemetery owners. Failing that, the school organized volunteer days to cut brush and remove illegally dumped tires, clearing 500 tires in one day. 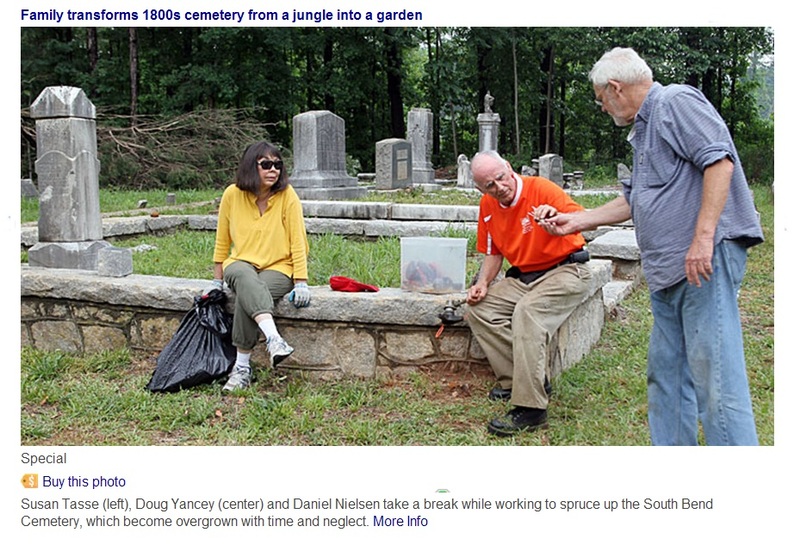 “I think having a cemetery next door is an asset,” said the academy’s executive director, Chuck Johnston. Kids at the academy can learn both math and history from the headstones. Randolph Ogden Yancey of Stone Mountain died one day shy of his 90th birthday on Jan. 24, 2010, and was buried next to his parents.